SBV Services is South Africa’s largest cash management service provider with over two thousand employees and six hundred armoured vehicles. Its shareholders and major customers are the four largest banks in South Africa. 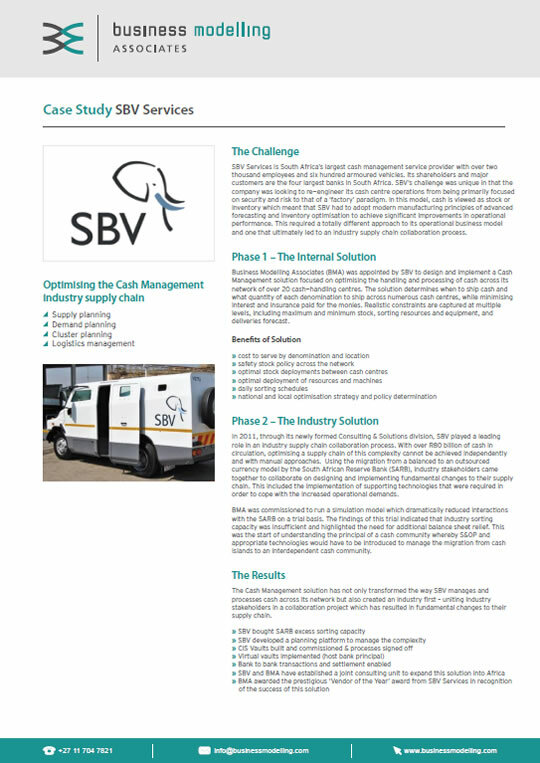 SBV’s challenge was unique in that the company was looking to re-engineer its cash centre operations from being primarily focused on security and risk to that of a ‘factory’ paradigm. In this model, cash is viewed as stock or inventory which meant that SBV had to adopt modern manufacturing principles of advanced forecasting and inventory optimisation to achieve significant improvements in operational performance. This required a totally different approach to its operational business model and one that ultimately led to an industry supply chain collaboration process.